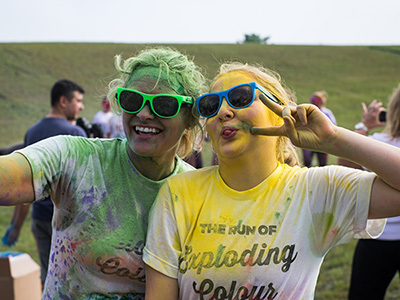 This 5k isn't a race but rather an opportunity for you and your friends to celebrate health and happiness while getting plastered in explosions of beautiful colour along the way. If it sounds ridiculous, it's because it is. Ridiculously fun! 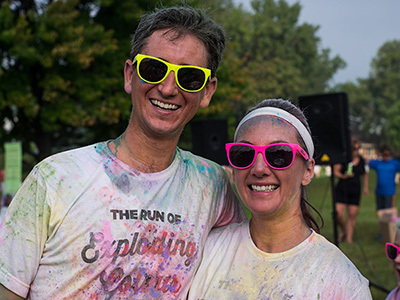 The Run of Exploding Colour is also an opportunity for us to give back and help promote the great work that charities in Ontario are engaged in. 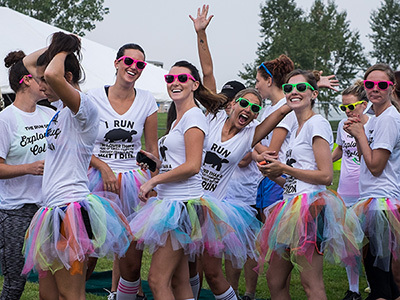 Any charity can sign up with us and use the event as a launchpad for their own fundraising efforts by having runners secure pledges for their organization. Is there a discount for kids? YES! 12 and under can run for $20 but they will not get a branded t-shirt. They will get sunglasses. All kids wishing to go this route do NOT need to register online. Instead their parent/guardian will sign them in on race day where they can pay $20 cash then. What time should I arrive on race day? Registration opens at 9:30am with the first set of runners heading out at 10:30am. Do I have to raise money? Nope. Just sign up and come to have fun! 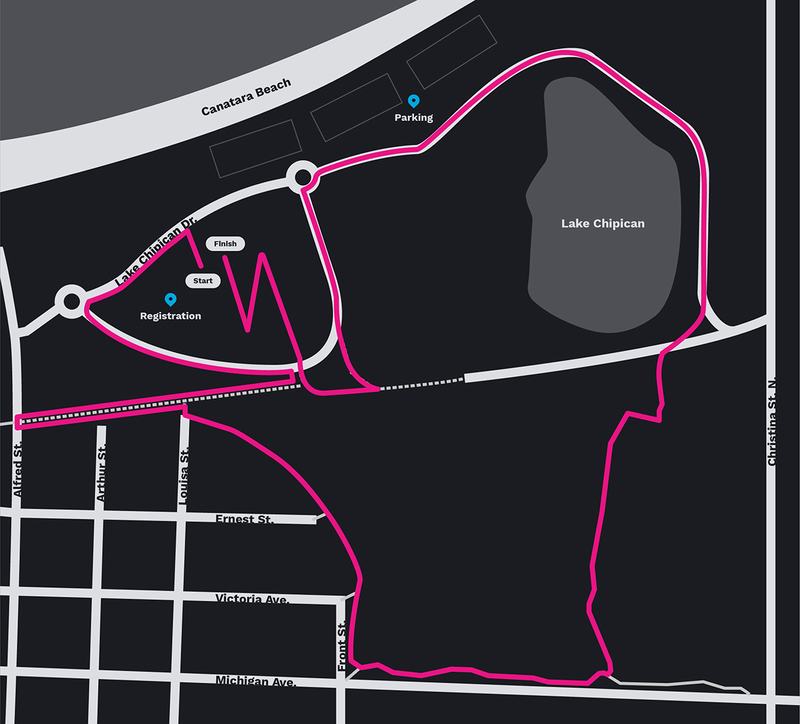 Beginning at 10:30am we'll start sending out groups of 10-15 runners in 5 minute intervals. At each KM marker the runner has coloured powder thrown on them so that by the end of the race they look like a million bucks. No. It's not a race, just a run. Everyone goes at their own pace. An awesome t-shirt and a rad set of sunglasses. You'll receive those items at registration. Is the event pet friendly? We like pets but just not at the event. Is the event kid friendly? We like kids and they're welcome to participate if they're 5 and up. There will be signs on site with parking instructions. It should take anywhere from 30-45 minutes unless you take your sweet time. Sure! But we'll also have water stations. 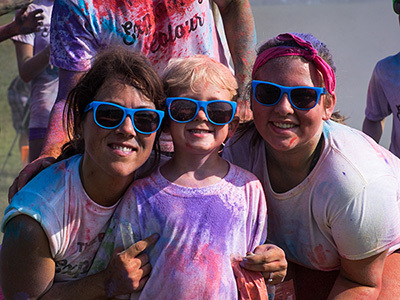 Is the Colour Powder safe? 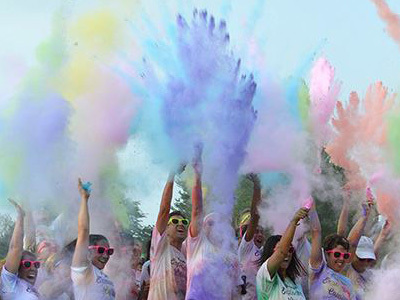 Our colour powder is completely cosmetic grade - meaning, yes, it's safe.